Pregnantly Plump: A future in music? Sweet Baby Plum is feeling better. 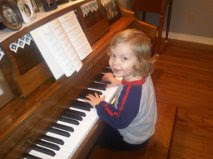 Here he is playing my parents' piano. He was singing along with the banging today, which is really cute. He actually picked out a tune on one of our little keyboards the other day. His love for music continues to grow. He's figured out how to get into our spare guitar closet (Doesn't everyone have one of those? To hold spare guitars, banjos, cases and accordions?) so he can access the soccer ball guitar Bob bought when I was pregnant with Little Elvis. Baby Plum can get the guitar out, and even manages to put the strap around his neck. He can strum, and tries to carry it around while playing. Little Elvis also has no interest in practicing. If he's not automatically good at something, then he doesn't want to do it. We think Baby Plum will be a practicer. He seems to like monotony. Most nights, Bob will pick out the same notes on the mandolin, banjo or guitar. I think Baby Plum will be like that. Little Elvis gets the no-like-to-practice gene from me. Bob is still hoping for a family band. If their personalities continue at this rate, we think Little Elvis will be the lead singer (wow, does he love an audience) and Baby Plum will be the lead guitarist. Cheese Puff is a mover and a shaker. Maybe he'll be the drummer? yes! you guys will be a great band. little j is a lot like elvis.... if she can't do it the first time, she's SUPER frustrated.